Africa hosts the world’s largest mineral reserves of platinum, gold, diamonds, chromite, manganese and vanadium. It also produces about 17% of the world’s uranium. The continent’s growth in the past has mostly been propelled by exaggeratedly high prices for these commodities, driven by Chinese demand for natural resources. “The commodities boom was a period of significant investment and growth, as mining companies focused on output at any cost to take advantage of the high commodity-price environment. However, the higher prices concealed the impact of falling productivity in the mining sector,” multinational services firm EY mining and metals sector leader Wickus Botha states. The recent economic slump in the commodities market has resulted in restricted growth, not only in Africa but also worldwide, with mines now consolidating their existing assets rather than expanding operations, he adds. In addition to plummeting commodity prices, rapid political and economic changes in many African States have made it increasingly difficult for many of them to attract miners, explorers and the prospective financiers that help drive their economies. 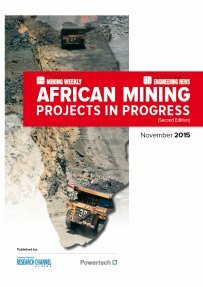 Creamer Media’s second edition of its African Mining Projects in Progress 2015 report tracks project developments taking place across various mining sectors on the continent, including coal, copper, gold, iron-ore, platinum and uranium. This report draws from material published over the past 12 months and is a summary of other sources of information published in Mining Weekly, as well as of information available in the public domain. This report does not purport to provide an analysis of market trends. Published on: 27 November 2015.